How, when and whether to deadhead poppies depends on the variety. Some poppies are annuals and other are perennials. If you're happy with the numbers of flowers your poppies produce, it's not necessary to deadhead them unless you want to keep them from spreading. Some varieties add interest to the garden with their attractive seed pods while others can become weedy. 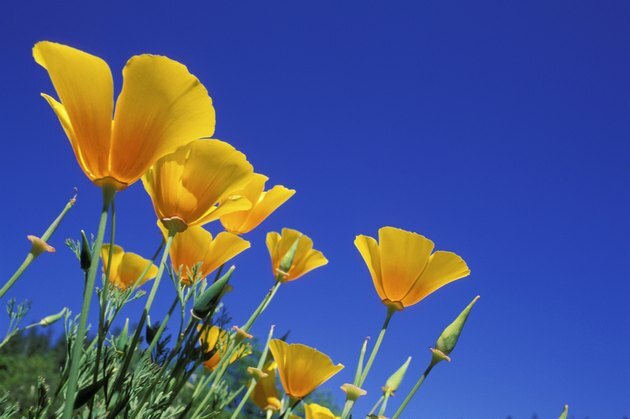 If not deadheaded, California poppies spread widely and can reduce erosion. Poppy stems tend to be tender. Your fingers or garden shears will serve for deadheading them. Wash your hands or use household disinfectant on your clippers first, to reduce the risk of spreading pests or diseases. To keep the poppy plants looking neat, clip or pinch off the spent blooms one at a time above the leaves, so you don't leave a bare stem. If pinching, your fingernails or the pressure of your fingertips will serve to remove the bloom. Don't pull or tug on the stem when deadheading. Some poppies may self-seed so extensively they take over your entire yard. Deadheading prevents seed development, allowing you to control your poppy patch and stop the spread. Annual Flanders poppy, also called Shirley poppy (Papaver commutatum), and California poppy (Eschscholzia californica) which is perennial in U.S. Department of Agriculture plant hardiness zones 6 through 11, seed widely. Deadhead perennial poppies to encourage more blooms. Perennials include Oriental poppy (Papaver orientale), which grows in USDA zones 4 through 9; Alpine poppy (Papaver alpinum), which grows in USDA zones 5 though 8; and Iceland poppy (Papaver nudaucaule), which grows in USDA zones 2 through 8. Some annuals, and perennials grown as annuals in cold climates, such as the Icelandic poppy, respond to deadheading by blooming more profusely. The flowering period for poppies varies by species and climate. Deadhead the poppies right after their petals drop. The longer you wait to remove the spent flower, the longer the plant's energy goes into developing seeds. Save time deadheading masses of poppies by using hedge trimmers or a shearing tool. Sharpen the tool if needed to make it more effective on fine stems but still disinfect it before and after use. You might leave a few Flanders poppies to set seed to enjoy their ornamental seed pods. The pods dry well for decorative arrangements. To allow limited self-seeding, leave a few flowers on their stems. To save labor and use the most vigorous self-seeding varieties to good advantage, sow them on hillsides and bare areas along walkways and roads. They help stabilize the soil and don't have to be replanted. Deadheading to increase blooms is generally most effective on perennials. To extend the blooming period for annual poppies, stagger the planting in the spring. Do I Have to Deadhead Lilies?